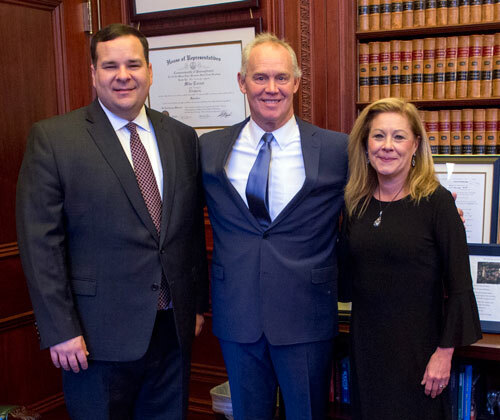 Pictured with Karen and me is Neal Lesher, my director of legislative affairs. It is with a heavy heart that I share the untimely passing of my friend and colleague Karen S. Coates, Esq. I want to tell you about this outstanding person who positively touched the lives of many people. We are devastated at the loss of our great friend and teammate who was an outstanding leader in state government, Karen Coates, the chief of staff of the speaker of the Pennsylvania House of Representatives. She was a person who broke glass ceilings, particularly as the first female to hold that position in the Commonwealth’s history. She always put her children first while balancing the immense responsibilities of managing a large staff and broad array of legislation. An attorney by training, Karen was intelligent, quick, strategic, savvy, straightforward and principled. She was also kind and respectful to all, humble and fun with a warm laugh. She was a role model and mentor to many on the House staff, as well as others. She was a natural leader and wise counselor. She personally resolved many legislative issues, helping to find solutions to move legislation forward on many of the most significant policy achievements of the past decade. We are indebted to her for her service to our team, the House and the Commonwealth. We will sadly miss her friendship. She cared deeply about her family, always dropping whatever was in front of her to talk to her daughter Caleigh and son Trey. She adored them and beamed talking about them. To them and her sister Andrea, brother Rick, mom Carmella, and companion Bob, we extend our love, support and prayers. Karen left us too soon. May she rest in peace with the good Lord.